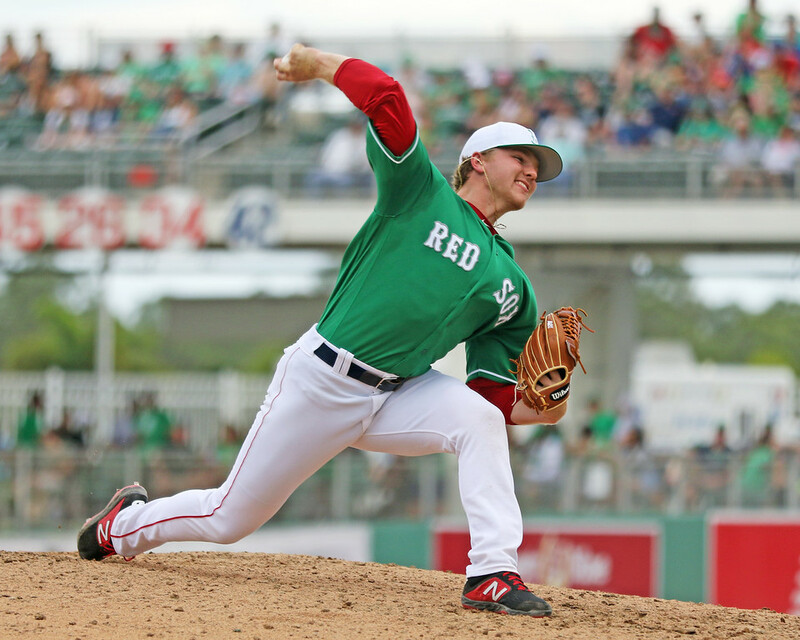 The SoxProspects.com social media team continues their #SP40 rundown on Twitter. Yesterday finished with the third-ranked prospect, left-hander Jay Groome, as the list nears the top spot. This season, we will also be offering a new feature to SoxProspects.com Patreon members. If you pledge $2 per episode and up, you can receive short audio recaps of games scouted by SoxProspects.com staff members. Check out this post for more information and details. 11 players were reassigned to minor league camp today as spring training winds down prior to opening day on the 28th. Alex Speier of the Boston Glove has the list of players: Catcher Oscar Hernández; Right-handers Zach Putnam, Erasmo Ramírez, Josh Smith, and Domingo Tapia; infielders C.J. Chatham, Bobby Dalbec, and Chad De La Guerra; and outfielders Bryce Brentz, Tate Matheny, and Cole Sturgeon. Much of the news over the weekend focused on two names and the first is a name you will not see on that list is 22-year-old Darwinzon Hernandez (pictured, above right). The lefty has appeared in five games thus far this spring and the stat line is impressive: 10 innings, 0.90 ERA, 1.20 WHIP, 12 strikeouts and five walks. 33 players remain in big league camp. Hernandez didn't begin playing baseball until he was 15, as Christopher Smith writes for MassLive. He talks with Smith in detail about switching from soccer to baseball and his development with the Red Sox. Sometimes it is tough for a young player to fit in in a major league clubhouse. Getting paired up in a card game ($) with Red Sox shortstop Xander Bogaerts has helped with that writes Jen McCaffrey for The Athletic. 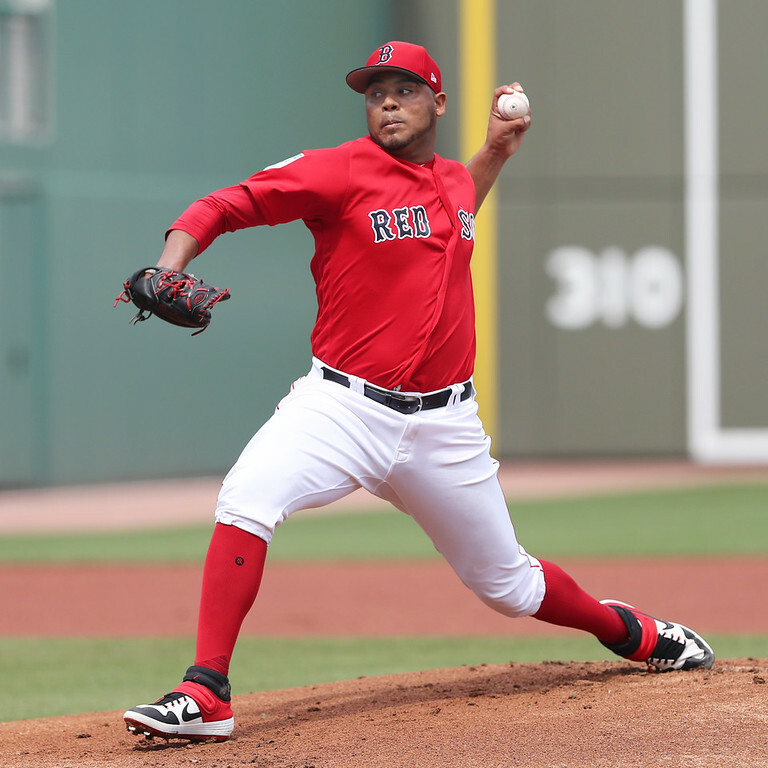 Though it seems unlikely that Hernandez, who only has pitched six innings at Double-A, would make the major league roster, Browne writes that it has not yet been ruled out. The other highly discussed name is reliever Durbin Feltman (pictured, left), who pitched for the first time in major league games on Thursday and Sunday. On Thursday he threw an inning with two strikeouts and a walk, and on Sunday he threw 2/3 of an inning with two hits, a walk, and two strikeouts. MLB's Ian Browne provides some more detail on his debut. The fast-rising reliever was always viewed as a player that could move quickly when he was selected in the 3rd round of the 2018 MLB draft. Speier says some even were wondering if that debut would come in 2018. While it did not, he certainly will merit consideration this year with a mid-90s fastball and a slider that has shown tons of movement this spring. McCaffrey also writes about Feltman's development and that he could go from college to the pros in a year ($), comparing it to other Red Sox fast movers Andrew Benintendi and Matt Barnes. This is not about the Red Sox system directly but the move could have wide-ranging implications. The Blue Jays recently announced that they have increased the minor league salaries by more than 50% ($) as Emily Waldon and Ken Rosenthal write for The Athletic. Minor league players being underpaid has been a hot topic in baseball circles over the last several years, and while MLB has not yet mandated any moves it will be interesting to follow the impact of this move by Toronto. Jumping in on Minor League Baseball's "Copa de la Diversion" initiative launched in 2018, the Salem Red Sox unveiled that they will be playing as the San Bernardos de Salem every Sunday throughout the 2019 season. Salem is the third Red Sox affiliate to join the Copa series, joining Pawtucket (Los Osos Polares de Pawtucket) and Greenville (Greenville Energia) among the 72 minor league teams in the series. Here is the list of minor league players who have appeared in spring training games since the last Fort Report, including some big names: Nick Lovullo, Bobby Dalbec, Aneury Tavárez, Mike Miller, Danny Mars, Brett Netzer, Durbin Feltman, Ryan Fitzgerald, Chris Madera, Jarren Duran, Josh Tobias, Cole Sturgeon, Jeremy Rivera, Jordan Weems, Jenrry Mejia, Adam Lau, Juan Centeno, Darwinzon Hernandez, Pedro Castellanos, Kervin Suarez, Deiner Lopez, Daniel McGrath, Joan Martinez, Jantzen Witte, Jagger Rusconi, Hunter Smith, Eduard Bazardo, and Triston Casas. Photo Credit: Darwinzon Hernandez & Durbin Feltman by Kelly O'Connor.